Water at the base of the commode is a real red flag. Fix the plumbing problem with the guidance and techniques here. The bathroom may well be the wet spot in any home, but water pooling around the base of the commode doesn’t fall in the norm. This dampness means it might be time to replace the flange, the circular pipe fitting that connects the toilet to the sewage pipe. Without a secure, solid footing on your commode, persistent leaking can damage flooring, cause mold to develop, or even emit wastewater, potentially causing hygiene and health issues for anyone in the household. 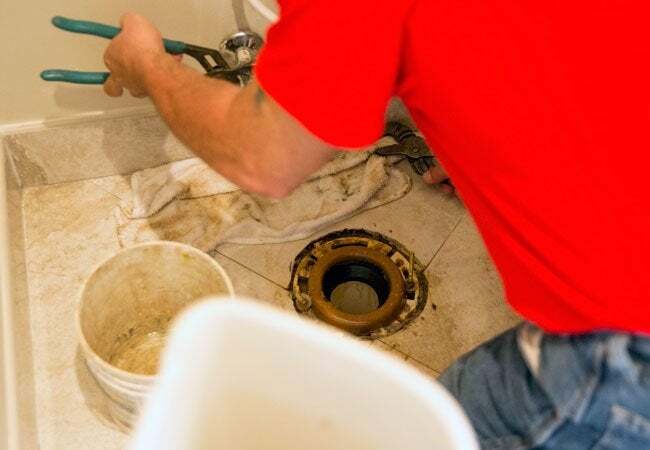 Luckily, swapping in a new toilet flange is a fairly common plumbing repair that many handy homeowners can manage, saving anywhere from $100 to $200 on hiring a pro. The keys to success are precise measurements (so that you purchase the right-sized replacement flange) and extra attention to ensure that the toilet sits flush on the floor at the end of the project. And remember to plan your DIY day accordingly: You’ll need to remove the toilet, measure the flange, and then make a run to the plumbing supply or hardware store in a short span so that you aren’t living with a nonworking toilet for long. Follow the instructions laid out in this guide on how to replace a toilet flange, and you’ll soon return to dry floors. Turn off the water main for the toilet by locating the knob on the wall behind it and turning clockwise. This will prevent water from refilling the tank after each flush, but won’t stop water from leaving the system. Once the water is turned off, flush the toilet, then wait for the bowl to refill, and flush again, repeating until all the water from both the bowl and reservoir has drained from the toilet. While the toilet’s draining, spread newspaper over the bathroom floor. Make sure there are several sheets of paper in layers, because this is where you’ll place the toilet once you’ve removed it from the mount. Disconnect the water supply from the toilet. This is a braided pipe or metal hose that runs out from the wall to the toilet, next to the valve. You should be able to twist it off by hand, but if it’s too tight, use an adjustable wrench. There’s no need to remove it from the wall unless you’re planning to replace it, too, or it’s so long that it might get in the way when your hands are full, trying to replace the toilet at the end of this project. Unfasten the two nuts on bolts that hold the toilet to the flange and floor. Use the adjustable wrench if the nuts don’t loosen easily by hand. Set the nuts aside to reattach the toilet when the flange replacement is complete. Prepare to remove the toilet, keeping in mind that the average commode weighs between 70 and 120 pounds. If you’re not confident in your ability to lift it on your own, enlist a helper. To avoid injury doing it yourself, straddle the unit, crouch down, and grab from under the bowl. Then engage your core and lift the unit straight up—using your leg muscles, not your back—so it that it lifts cleanly off the bolts. Set it carefully atop of the newspapers. Now you’ll see the outflow or sewage pipe with the flange. Remove the old wax that sealed the toilet to the flange and pipe with a putty knife. Simply scrape it off and smear it on the newspaper until you can access the top of the flange. Find the screws (up to four) on the outside of the flange, which will need to come out. Use your multi-head screwdriver fitted with the corresponding screw bit to remove the screws. Lift the flange off and clean it under a faucet or with disinfecting wipes. Set it aside on the newspaper. Tuck the disposable rag into the mouth of the sewage outflow pipe to block unpleasant odors and gasses from emitting. Measure the width the outflow pipe’s mouth. Double-check your measurements and make note of them. Put the old flange into a plastic bag and head to your local hardware store, plumbing supply, or home center and buy a flange of corresponding size, type, and shape. Having the old flange with you allows for a head-to-head comparison. Purchase a correct-size wax seal for the new flange too. The new flange should come with new bolts and screws; if not, buy those as well, checking for fit. Once back in the bathroom, remove the rag from the outflow pipe and place it in a plastic bag for disposal. Fit the new flange into place over the outflow pipe. Double-check that the new flange is flush against the floor and fitting correctly with no gaps below. Now screw the flange into place on the mount, using the new bolts and screws. When done, you’ll have two bolts protruding up from the flange and floor, where the toilet will be remounted. Turn the toilet sideways on the floor and locate the round mouth where the toilet sits atop the flange. Affix the new wax seal around the mouth by pressing firmly into place without over-handling or misshaping it. Carefully lift the toilet (use your legs, not your back!). Watch for the bolts to meet up with the bolt holes on the toilet base. Lower the toilet slowly, as levelly as possible, so it slides over the bolts and returns to its rightful spot. Eyeball the base to see if it looks level on all sides. If not, wiggle it until it’s situated equally all around. Now put your weight into it and press the toilet down as firmly to engage the wax seal with the flange. Replace the nuts back onto the bolts. Use your hand at first, and then tighten with the adjustable wrench to ensure the toilet won’t rock or wiggle in months to come. Reattach the water supply hose to the inflow valve on the toilet. Make sure you’ve got it affixed tightly so there’ll be no dribbles or leaks later. Turn the water valve back on and wait for the toilet reservoir tank to fill. Once full, flush it. Wait for the bowl to fill, then flush again. Do this two to three times to ensure proper function. 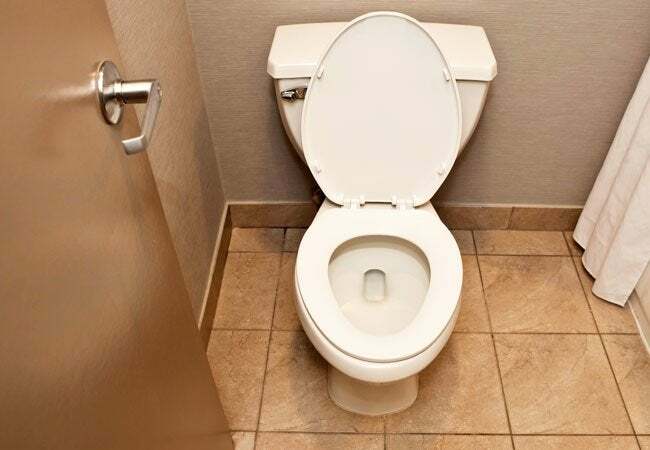 If the toilet is flushing correctly, run your hand along the floor around the toilet base. Is the floor dry? Great! Clean up and congratulate yourself on doing the job like a pro!